Burbank, CA, September 30, 2011 - In brightest day, in blackest night, no evil shall escape my sight... take the oath to serve and protect when Green Lantern flies onto Blu-ray 3D Combo Pack, Blu-ray Combo Pack, DVD and Digital Download on October 14th from Warner Home Entertainment Group. 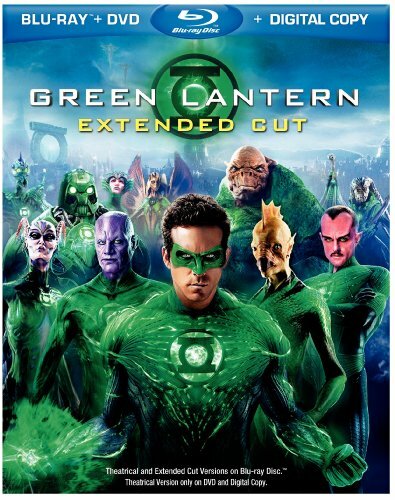 Starring Ryan Reynolds ("The Proposal") in the title role, DC Comics' legendary super hero soars to the edges of space, where a war has been raging between those who rule with fear, and those who protect life: the Green Lantern Corps. In addition, the Blu-ray 3D Combo Pack and the Blu-ray Combo Pack will offer Sony PS3 users an access code to unlock the Sinestro Corp Batman Skin for the highly anticipated "Batman: Arkham City" video game. The skin will give users the ability to fight crime with the help of the yellow power of fear, giving Batman a unique yellow costume in the story campaign and in the challenge maps. Directed by Martin Campbell ("Casino Royale"), "Green Lantern" also stars Blake Lively (TV's "Gossip Girl"), Peter Sarsgaard ("Knight and Day"), Mark Strong ("Sherlock Holmes"), Academy Award(R) nominee Angela Bassett ("What's Love Got to Do with It") and Academy Award(R) winner Tim Robbins ("Mystic River"). Also featured are the voice talents of Oscar(R) winner Geoffrey Rush ("Shine") and Oscar(R) nominee Michael Clarke Duncan ("The Green Mile"). Warner Bros. is taking Digital Copy to a whole new level. UltraViolet Digital Copy includes a Standard Definition Digital Copy of the theatrical version of the film. Restrictions apply. See packaging for details.